Movies about American politicians embroiled in controversy have sort of lost their power in the last couple of years, knowing that, these days, in reality, the chances of a controversial candidate attaining victory is absurdly high. We can make our mind up about a Gary Hart biopic before we've even seen it, chastising the man and any attempt to humanise him. Or we can watch The Front Runner for Jason Reitman's very nuanced portrait of the disgraced politician, which doesn't let him off the hook but doesn't refuse to criticise the media circus around him either. Based on the book 'All the Truth is Out: The Week Politics Went Tabloid' by Matt Bai (who also co-wrote the screenplay with the director and Jay Carson), this film follows Democratic candidate Hart’s presidential campaign over three weeks in 1988, which was disturbed by allegations of adultery. How ill-considered actions and dishonest reactions can cost you the position of a lifetime. The tagline sells his story as an event that changed American politics forever. Sure, one major decision will indeed change something forever, but isn’t that tagline relevant for most films based on American politics? It’s not the ideal selling point for the film, which is rather fascinating in its presentation of the battle between ethics in politics vs ethics in news reporting. Affairs and media lies are eerily appropriate topics to touch on today. Like watching the general elections, the race to the truth at the centre of The Front Runner compellingly plays out like a thriller. The "act" is never depicted - what’s more important is how Hart responds when the rumour mill gets going. Repeatedly brushing off the hearsay to his campaign team by stating that "the public doesn’t care" about these details of his personal life, Hart speaks from the experience of a man who has come so far in his career without engaging with the hearsay. Now, at the peak of his mountainous climb to the top - which the Coloradoan politician symbolises by shooting his announcement video in the Rocky Mountains - he’s severely underestimating the impact of tabloid journalism. In that regard, it’s fair to say that the week politics went tabloid did indeed shift American politics to never be the same again, justifying why The Front Runner would sell itself in this particular way despite my previous point about unoriginality. 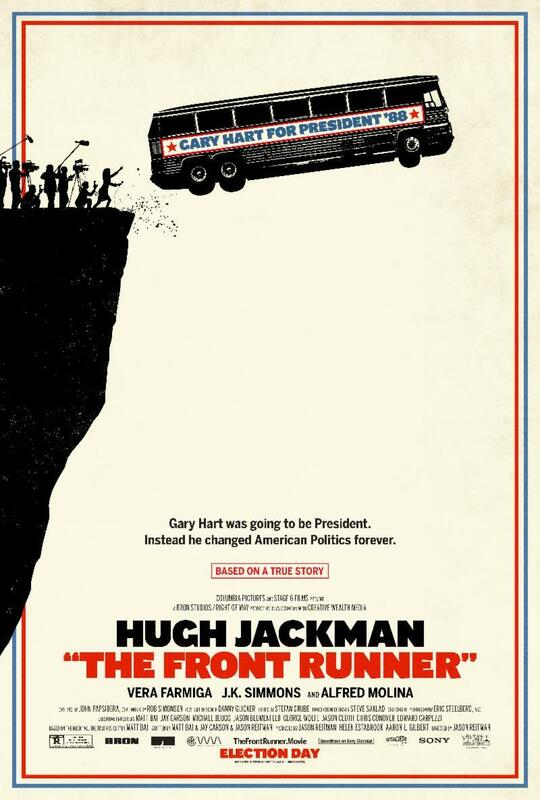 Elaborating on this point about tabloid journalism interference in politics through the focus on personal lives, The Front Runner paints the Miami Herald’s reporters in a bad light by highlighting their invasion of privacy tactics and their conclusion-hopping prior to getting all the facts. Having the newspaper’s team played by comedians (Mike Judge, Bill Burr, Kevin Pollak) implies that they’re kind of a joke. Their portrayal comes at the risk of leaning too much in favour of the politician, but bridging the gap between fake news and suspicious politicians is a Washington Post reporter with direct access to Hart, A.J. Parker (Mamoudou Athie). He’s the only press person gifted with the trust of Hart, so if the potential president can’t give him straight answers, there’s no hope for anybody else. Their relationship is one of the key components of the film, emphasising Reitman’s only agenda, which is to learn more about Hart, but only through the verifiable lens of a good journalist. So, understanding that this is a legitimate profile of Hart, there’s the need for a fine actor to take on such a meaty role. Hugh Jackman knocks it out of the park. The actor enters new territory with this political drama and navigates it with finesse. Firing off politic-speak with a sharp tongue, it feels like the Oscar nominee - who may be rewarded a second nomination for his efforts here - has unearthed abilities within him that audiences have never seen before. Typically sticking to heavily physical (and often angry) roles, we're used to his characters reacting with either physical or verbal violence, so his generally calmer demeanor during tense moments (of which there are plenty) constantly upends our expectations. What will Hart have to say about this? Jackman ensures the answer to that is captivating to watch. His campaign staff - made up of a cohort of very good actors including JK Simmons, Chris Coy and Alex Karpovsky - are fully attuned to the Sorkin-esque script, having fun with the wit and quips. I have to describe the film with trite, obvious descriptors such as "timely" and "relevant," but the strong parallels to present-day political scandals are undeniable. The Front Runner may not be the most incisive political drama but its foreshadowing of the contemporary political landscape is valuable. At the very least, what it has to offer is a terrific Jackman performance and a confirmation that Reitman has returned to form this year. 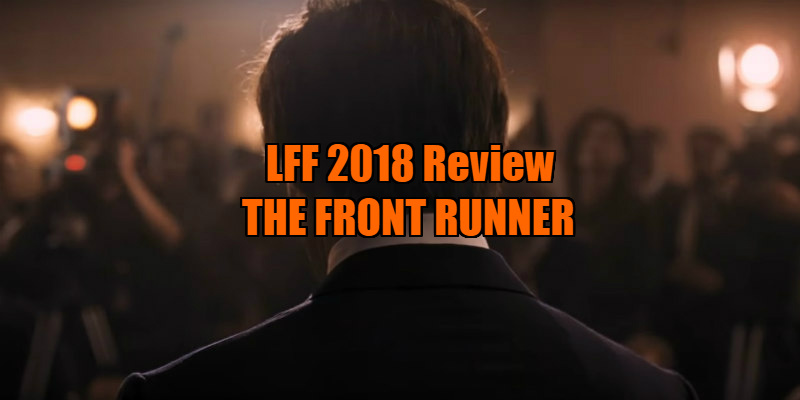 The Front Runner is in UK/ROI cinemas January 25th, 2019.